The Minister for Transport, Tourism and Sport, Shane Ross TD, has announced details of a €483 million investment programme for 2019 for regional and local roads. 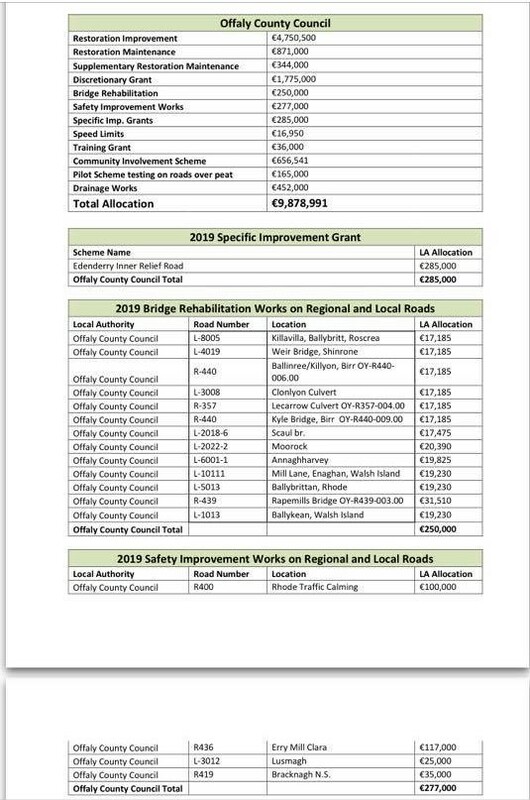 The funding includes almost €10 for Offaly roads, including €285,000 for an inner relief road in Edenderry, €344,000 for restoration maintenance and €165,000 for a pilot scheme to test roads on peat. The funding has been welcomed locally with Cllr Eddie Fitzpatrick saying, "this funding is very much welcomed at this time" but stressed "much more is required to improve our road infrastructure especially across north Offaly and also for safety measures such as traffic calming in areas of high volumes of traffic movement to ensure safety for pedestrians and motorists." He welcomed the fact that Walsh Island and Rhode had been granted funding under the 2019 Bridge Rehabilitation works on regional and local roads, and that Bracknagh National School had been awarded €35,000 under 2019 safety improvement works to ensure safety. Cllr Noel Cribbin said: " I certainly welcome the recent announcement by Minister Ross of a 16% increase in Offaly’s roads allocation. This should equate to over €3 million euro for north Offaly, again an increase from €2.5 million in 2018." "Restoration improvements get the biggest share at €4.75 million, restoration maintenance at €871,000, community involvement scheme at €656,000 and an interesting sum of €165,000 for a pilot scheme testing on roads over peat. "With over 50% of our roads in north Offaly built over peat, I will certainly be looking for that money to be piloted on one of our many bog roads," Noel said. "We will be having our roads allocation meeting in the coming weeks as to where we will prioritise and spend this money on our roads in North Offaly for 2019 and whilst it’s a huge sum of money, it has to cover over 550 kilometres of roads," Cllr Cribbin said. Cllr Cribbin will be looking for monies and works to be carried out in the likes of Father Paul Murphy Street, Colmcille Road, St Francis Street, Fr Kearns Street, Ballycolgan, Little Island road to Daingean and Ballybrittan Bridge.